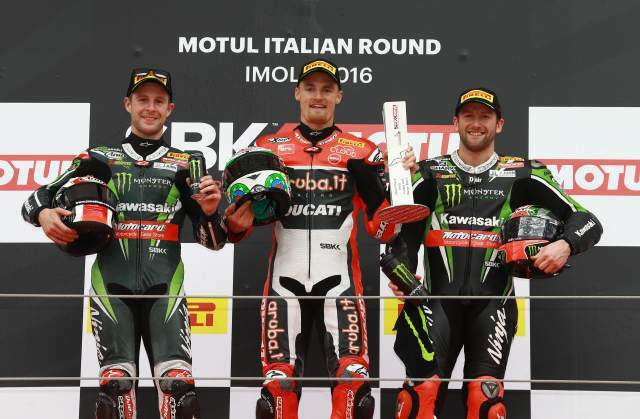 REIGNING World Superbike champion Jonathan Rea is currently in the midst of retaining his title, but Aruba.it's Chaz Davies is bridging the gap with only 35 points between them after he did the double in Imola. Rea's team-mate Tom Sykes is currently third with Michael van der Mark in fourth, 48 points behind. Davide Giugliano is in fifth with Jordi Torres in sixth in his second year of World Superbikes. Kentucky's Nicky Hayden is seventh for the Honda squad with 82 points while Leon Camier and Alex Lowes are ninth and 10th respectively. The next World Superbike round takes place in Malaysia in two weeks' time at the Sepang International Circuit.